Beckey-Chouinard: 5.10-, 15-18 pitches, grade IV. This is a Bugaboos mega-classic that draws climbers from around the world and for obvious reasons. It’s 2000′ tall and has pitch after pitch of esthetic 5.8 and 5.9 climbing with short sections of 5.10 above Great Sandy Ledge on the Upper Headwall. The elegant line follows a large buttress that soars up the full height of the West Face. The Beckey-Chouinard is typically guided as a one day route with a fit client starting from a camp at the Pigeon-Howser Col or down in East Creek Camp. The descent is by 6 rappels down the East face to the Upper Vowel Glacier. Expect a 14-16 hour day camp to camp and a climb of a lifetime. To climb this tower, you will have to have completed the NE ridge of Bugaboo Spire first or the West Face of Snowpatch Spire to ensure adequate fitness. 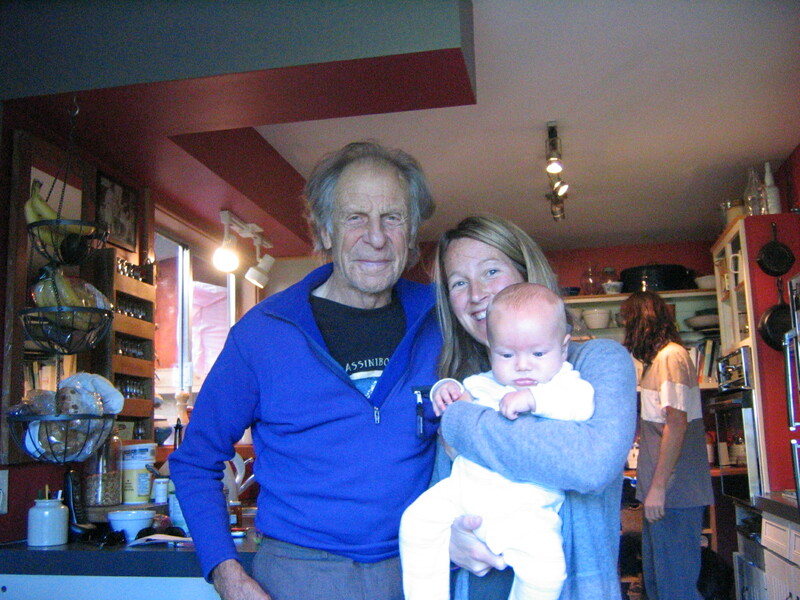 Pictured is Fred at my house in 2005 with my wife Anik, and my son Tysen. Fred and I did several trips together including the Chehalis in 1998 and the Adamants in 2001. On both trips Fred was integral in providing us with coveted information leading to some classic first ascents, and for that, thanks Fred!